Today's client has a lovely shape that was hidden by the improper fit of this dress. Since she had a definite waist curve, the dress fit better after I took in the sides just a bit. As you can see, though, the extra detail made it a little more difficult.Sorry that I do not have a full length photo of the dress. It would remind you of a flapper, with the black lace at the bodice and thin layers of fabric running horizontally down to the hem. 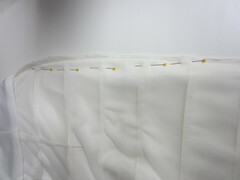 After pinning the garment on the lady, I transferred pin marks to the inside of the dress. 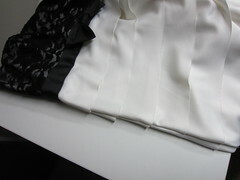 As best I could, I felt for the placement of the layers so I could align them before sewing. Basting this new seam would be another option to keep the layers matched. You can see here that the new seam looks pretty good. Originally, the layers were not perfectly matched. However, the client may not know this (I didn't point it out at the fitting) and I don't want her to think I didn't care enough to do a better job of matching. 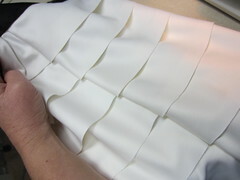 The dress is a polyester fabric and these layers are not hemmed. They need to be light and swirly so that the dress "shakes" when she moves. 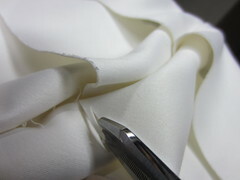 So I can careful trim a bit off of the layers that are mismatched and taper that into the side seam. Here is a picture of the result. Each layer matches better than it did originally and the dress looks perfect. Trimming those ends a little bit sure beats ripping and redoing two side seams and using trial and error to get results that may never be perfect. I'm very happy with the finished dress! Are You Using the Right Size Needle? How Do I Get Inside this Coat Lining?? Have You Ever Said "Pass" on a Job?